As a Las Vegas real estate agent I find great value in tools that make my life easier. My cell phone contract at Verizon ended so I opted to leave my treo and go to a Windows Mobile product. I searched around and found one to settle into. I chose the Samsung i760. The reviews for it have been outstanding for the most part. I wouldn't say the phone is perfect but they are getting close. It has a slide out qwerty keyboard for texting, email, and note taking. It comes ready to roll with MS Word, Excel, and Powerpoint. It allows you to pop your email from most servers. In fact, I can get my Yahoo mail, Hotmail, Gmail, etc. It comes with the Picsel Browser which allows you to look at web sites as if they were on the iPhone. It's voice recognition software is very handy when on the road. You hold down a button and say "Call [name] on mobile" and it dials the number. You say "what is my battery level" and the voice says, "Your battery level is x%". You say "Open Word" and it does. You tell it to "play music" and she asks you what kind. You respond "any" and she randomly selects a track. And, considering it's a phone, the speaker sounds great. Bluetooth works better than the Treos. The best part is that as a Realtor I can access the MLS, Top Producer and other CRM tools. I can look up maps easily etc. So far I have been very pleased with the phone. The only drawback is that the earpiece sounds a bit "tinny" unless you use bluetooth. 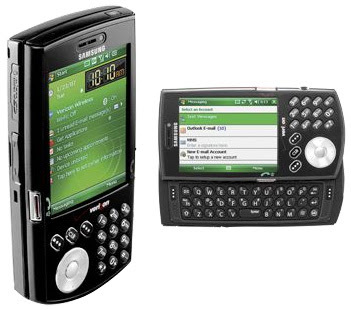 Other than that I would highly recommend the phone on your next upgrade from the treo or any other handhelp pocketpc.